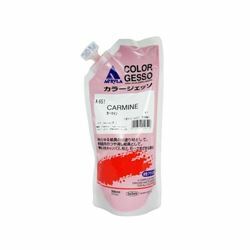 Available in 22 colors Holbein Colored Gesso is thick, creamy, and offers superb coverage and great opacity. Holbein Artist Colored Gesso is made with high chroma, lightfast pigments and can be used as a successful ground or as a painting medium on its own. Finishing to a mat surface, Holbein Colored Gesso is the ultimate versatile medium. Holbein’s innovative and unique package design provides for easy pouring and storage. No more rigid plastic containers with difficult lids to open and crusted color around the top!